The charter created the burgage plots — long, narrow plots which can still be seen in the property boundaries on the west side of Castlegate and east side of Bridge Street. Large-scale sheep farming, wool production and weaving were the mainstay of Helmsley’s economy for several centuries. Despite setbacks, including marauding Scots and the Black Death, Helmsley grew steadily throughout the Middle Ages. When wool production declined after the dissolution of Rievaulx Abbey, Helmsley’s weavers turned to flax, much of which was imported. The weavers were located on Bond and Bridge Streets. By the beginning of the 17th century the form of Helmsley was largely complete, and many buildings in use today date from this period. The oldest surviving house is Canon's Garth, the vicarage. The town remained with the holders of the barony of De Ros through the Earls of Rutland and the Dukes of Buckingham until it was sold to the city financier, Sir Charles Duncombe in about 1689. The ruined Norman castle is the most significant medieval survival of the buildings in the town, although parts of the parish church and Canon’s Garth are mediaeval in origin. The 18th and 19th centuries saw major developments and expansion in the hands of the Duncombe family, beginning with the construction of Duncombe Park outside the town. At the beginning of the 19th century the cottage weaving industry declined in the face of competition from new industrial cities. Despite this, the 19th century saw various major development in the town, notably the rebuilding of All Saints' Church, and at the end of the century, building of the town hall. More houses were built along Bondgate and, after the arrival of the railway in 1871, along Station Road. This period also saw older houses remodelled so that little thatch remained in the town. With the decline of weaving, agriculture became the mainstay of the economy. On 30 June 2011, the BBC2 programme featured an archaeological investigation into four 2, 000-year-old skeletons found in Windy Pits caves, concluding that at least one had been the victim of a ritual killing, including scalping. The findings, including the facial reconstruction of the scalping victim, were presented, at Duncombe Park, to local history experts. 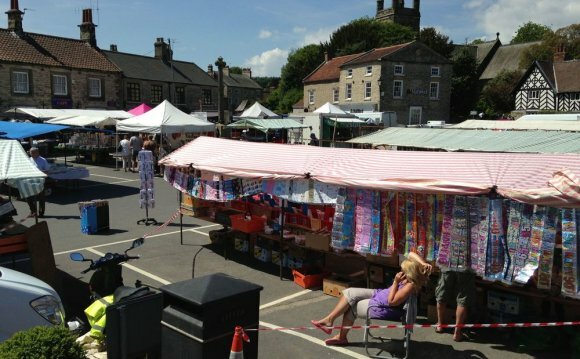 Helmsley is situated on the southern boundary of the North York Moors National Park approximately 200 feet (61 m) above sea level. The town's geology is sandstone. To the west and the north of the settlement the moorland areas are predominantly limestone. Helmsley lies in a hollow in undulating open countryside, flanked by heather moor to the north and the rolling farmland of the Howardian Hills to the south. The flat lowland of the Vale of Pickering stretches eastwards from the town towards Malton. The River Rye runs by the town to the south where it is joined at Rye Bridge by the Borough Beck flowing southwards through the town from the moors. Meadows south of the Rye form an important buffer and create an attractive setting for the town from the southern approach. The area was affected by flash flooding on the night of 19 June 2005. An electoral ward in the same name exists. This ward stretches north from Helmsley with a total population of 3, 066 measured at the 2011 Census. The population of the larger Helmsley ward area was recorded by the 2001 Census as being 3, 097. North Yorkshire County Council, however, estimated in 2000 that the population of the actual urban town area was approximately 1, 500, measured at 1, 515 in the 2011 census. The town is in the catchment area of Ryedale School.